Beautiful -Waterfront Custom Built Home Has it All! Beautiful 1.54 acre lake lot on High Rock Lake! Waterfront 1.5 Story Lakehouse w/ Private Floating Dock/Pier! All is needed is you! If you’re in search of lake homes for sale, take a look at High Rock Lake in North Carolina. Positioned in the north central region of the state, High Rock Lake is North Carolina’s second-largest lake, spanning 15,180 acres. In addition to offering some of the finest fishing in the state, this lake is the recreation destination for the many communities that line its shores. Called the “crank bait capital of the world,” High Rock Lake has attracted anglers for years with its 365 miles of pristine shoreline and quality fishing. The lake’s relatively shallow waters are ideal for largemouth bass fishing, and the lake also has large populations of white bass. Similarly, you will find crappie, bluegill, sunfish, striper hybrids, and different types of catfish in abundance. Although taking to the water with rod in hand is enjoyable year-round, the optimal fishing seasons are late spring into summer and late fall into winter. 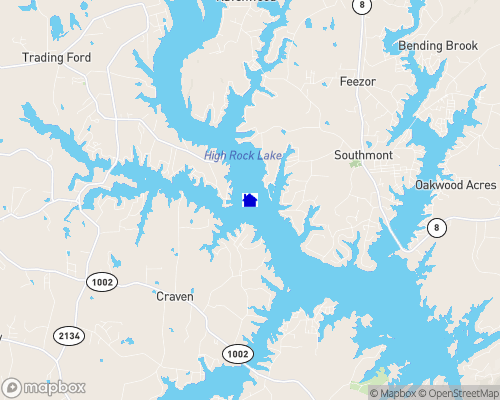 High Rock Lake is named after the neighboring mountain in the Uwharrie range, and it touches several communities, including High Rock, Lexington, Linwood, Salisbury, Southmont, and Spencer. Lake home owners in these communities have full access to the lake’s many amenities and recreation opportunities. Multiple public boat ramps are situated around the lake, providing entrance to the water free of charge. And unlike many municipal lakes, High Rock Lake is open 24 hours a day, and it imposes no speed or size restrictions on watercraft, giving you the freedom to launch your powerboat, Jet Ski, kayak, or pontoon and really enjoy yourself. Find your land legs and head off the lake for prime outdoor adventures and sports. Hiking, cycling, and exploring are encouraged around the lake and in the Dunn’s Mountain and Eagle’s Nest Nature Preserves. And many people take to the links for a day of healthy competition. With courses like Corbin Hills Golf Course and Crescent Golf Club in the vicinity, the potential to hit your next eagle shot is always within reach. If you’re interested in living on any golf courses in the High Rock Lake area, visit GolfHomes.com for property listings and details. Of course, one would be amiss not to note that within just a short drive of High Rock Lake is Lexington, which has earned the proud reputation for being the “barbecue capital of the world.” Boasting over twenty proper barbecue joints, Lexington is the town to visit for finger-lickin’-good fare. The Country Club of Salisbury is also nearby, and it has hosted some of the finest social occasions in the South since 1919. So whether you're on the water near your lakefront cabin or enjoying yourself in one of the many towns nearby, High Rock Lake knows the recipe to offering a memorably good time for all. High Rock Lake is located in Davidson and Rowan Counties, North Carolina, approximately 12 miles from Lexington, NC on Highway 8. A 15,000-acre reservoir on the Yadkin River featuring excellent boating and fishing opportunities. High Rock Lake is the 2nd largest lake in North Carolina. For information about hunting and fishing regulations and licensing, contact the NC Wildlife Dept. at 919-662-4381. Boat Docks: Are they permitted? Yes, with the permission of APGI (Alcoa Power Generating Inc), who maintains and controls the lake's water levels and quality by federal regulations. Building restrictions: High Rock Lake has very diverse building restrictions and requirements. It has many communities with no restrictions/requirements that have been on the lake since the lake was created - handing down the little fishing cabin to the next generations. Public boat ramps are located at Smiley's Tamarac Marina (Fee) and at Wildlife Access, by the Second Creek bridge on Bringle Ferry Road. Work with the #1 Lake Front Team in NC!